The AV8 is ABIT 's version of the VIA K8T800 Pro performance chipset based on AMD Athlon 64/64FX Socket 939 K8 CPU platform. 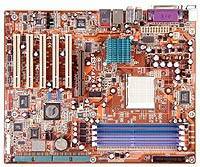 With SATA RAID, Dual DDR400, AGP8X/4X, IEEE1394, GigABIT LAN, and uGuru technology, this board is the performer of the year. Using the groundbreaking Hyper Transport Technology and gushing with extra capacity and peripherals support as well as first class onboard sound, this board can easily be your foundation for a superb system.